Are Blue & Green Kitchen Cabinets Pushing Aside White?… – Living Your Lifestyle & Owning It! Yes, time and again the data show that the majority of people prefer white kitchen cabinets, followed closely by gray. But these days you can’t help but notice the abundance of blue and green cabinets popping up in kitchen design. 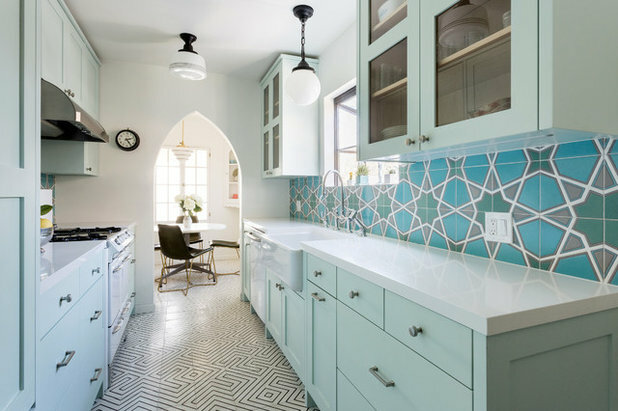 Here’s a look at eight kitchens with blue or green cabinets that grabbed a lot of attention! 1. 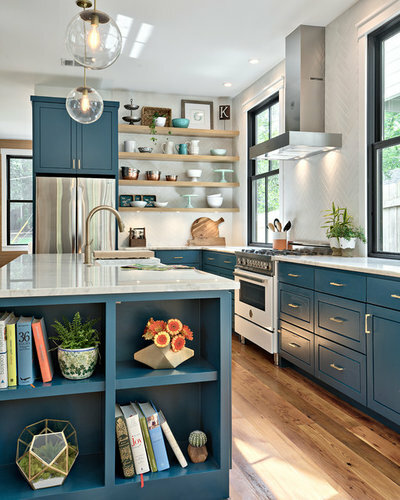 Rich blue cabinets join brass hardware in this light-filled Austin, Texas, kitchen — a remarkably palatable recipe for modern-day design. Grainy, light-wood floors and open shelves add warmth, while a herringbone white-tile backsplash, white range and white-gray countertop provide enough negative visual space to balance the deep cabinet color. 2. If this gorgeous green cabinet color doesn’t make you forget about white cabinets, then perhaps there’s no swaying you. Like blue, green works great with warm woods and brass finishes. 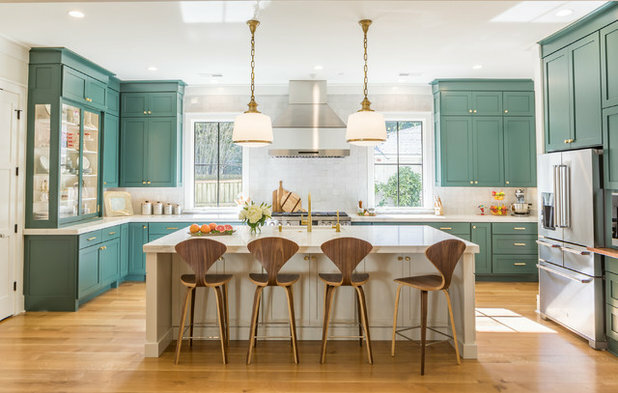 It’s also a good color for a large kitchen with a lot of cabinets because it softens natural light, keeping the room from appearing too bright. 3. 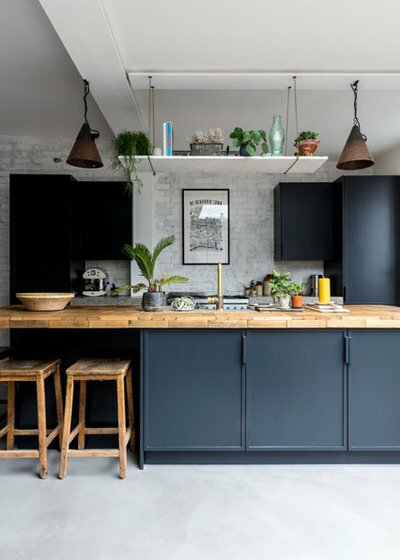 Navy blue cabinets pair with worn brick, wood and metal finishes to create a sophisticated look in this London kitchen. 4. 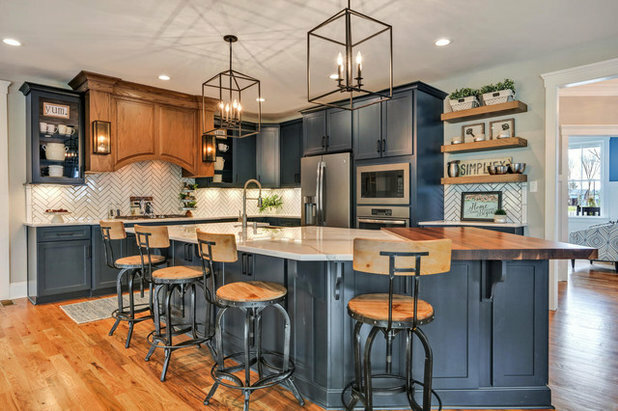 Prefinished cabinets (Baltic blue from Echelon Norwich) combine beautifully with honey-colored wood tones and wrought-iron light fixtures and stools. 5. 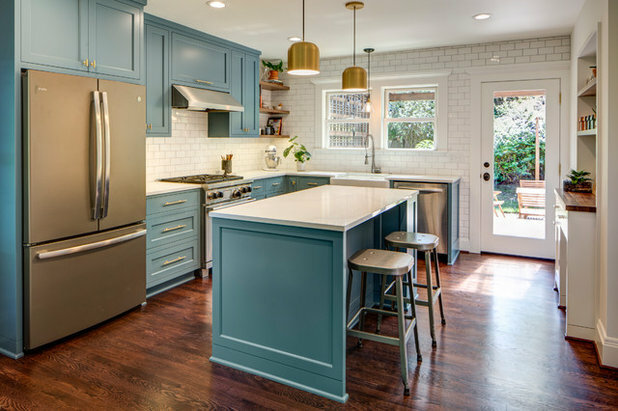 Here, refreshingly greenish-blue cabinets (painted in Serene Breeze by Benjamin Moore) happily hold court with a dazzling blue backsplash. 6. This soft blue (Philipsburg Blue by Benjamin Moore) is great for a traditional home where you want to introduce some uplifting color while still conveying an old-fashioned vibe. 7. Noticing a pattern yet? 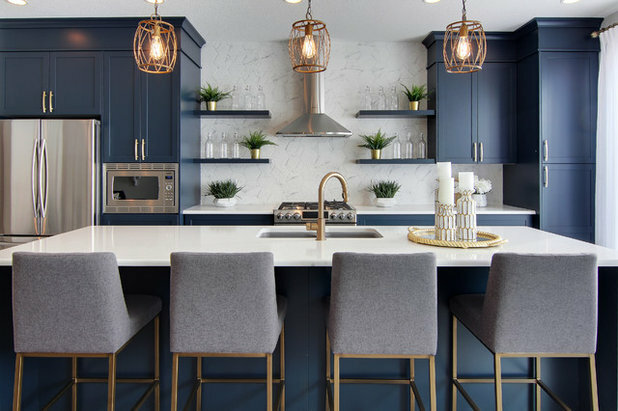 Blue cabinets work especially well with warm brass finishes and a crisp white backsplash. It’s hard to find an easier approach to creating tailored style. 8. Sometimes just a couple of punches of a color are all that’s needed to temper a kitchen cabinet scheme. 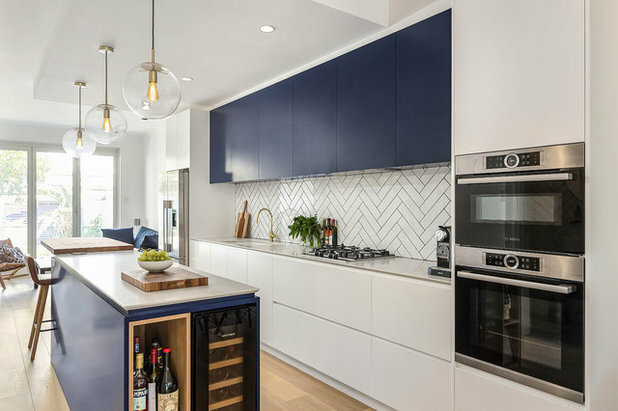 In this Sydney kitchen, dark blue on the upper cabinets and island provide contrast to the white backdrop.